A list of the services of Passmore & Associates, LLC extends beyond the traditional realm of accounting firms. We prepare tax returns and we provide accounting services, of course. All accounting firms do. 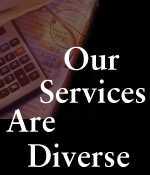 But our services are unique. Our clients' needs are foremost with us. We believe that our approach of anticipating, rather than solving problems; of communicating timely information, rather than answering questions, gives our clients the assistance they require in making complex management decision. The quality of our services are further enhanced by the broad cross-section of small to medium-sized businesses we represent. Our clients reflect the diverse Houston economy from banking, construction and engineering to law and medical practices, municipalities and manufacturing. In the energy industry, we work with oil and gas development and operations, oil field services and gas plan operators. Investment builders, real estate investors, retail and wholesale sales - our experience is vast and diversified.